Educator, artist, world traveler. 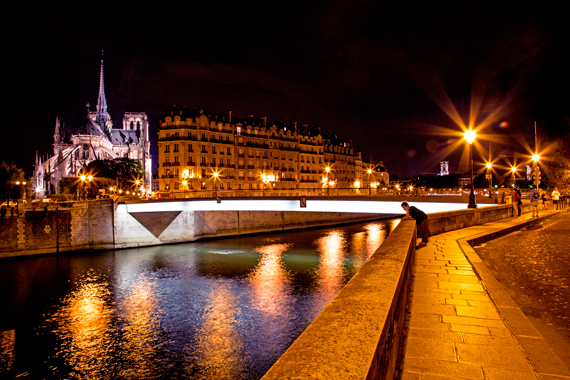 Author and photographer of the award-winning coffee-table book, Bridges of Paris. The bridges of Paris are not just for crossing. Each is its own unique and beautiful travel destination. Thirty-seven bridges cross the Seine river within the city boundaries. 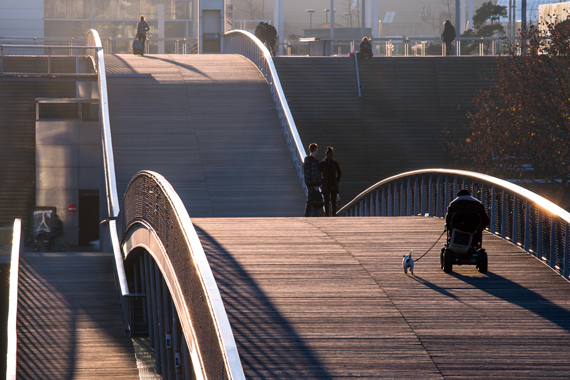 Some are just for pedestrians or trains, most carry motor-traffic and two bridges carry all three. 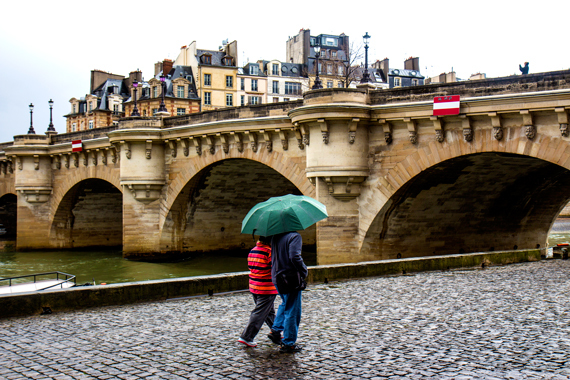 Bridges have spanned the Seine since well before 100BCE. Three existing bridges were erected in the 1600s and the newest was opened just ten years ago. Here are five of my favorites. 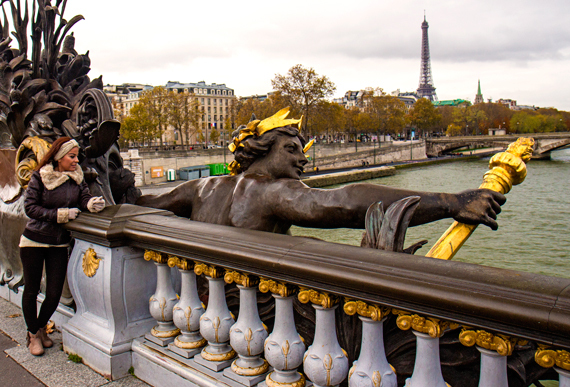 Next time you are in France, tour the bridges of Paris and discover your favorite. 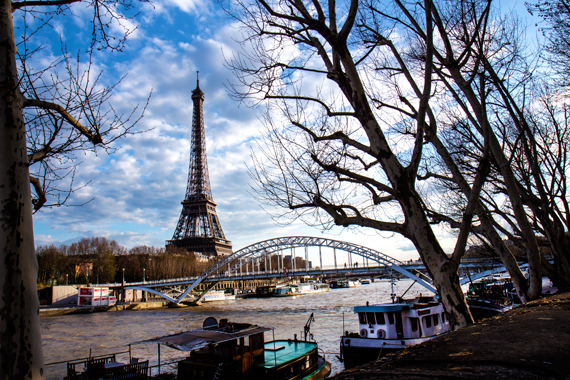 Lovers can enjoy the Parisian sunset and the twinkling lights of the Eiffel Tower on this quiet, romantic footbridge. 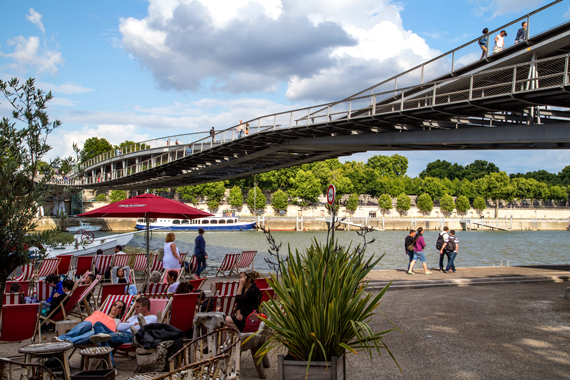 The Passerelle Debilly is just a five-minute walk from the Eiffel Tower, crossing the Seine just as the river begins its wide turn from the west southward. Shortly after the fall of the Berlin Wall in 1989, a secret agent from East Germany was killed on the bridge. 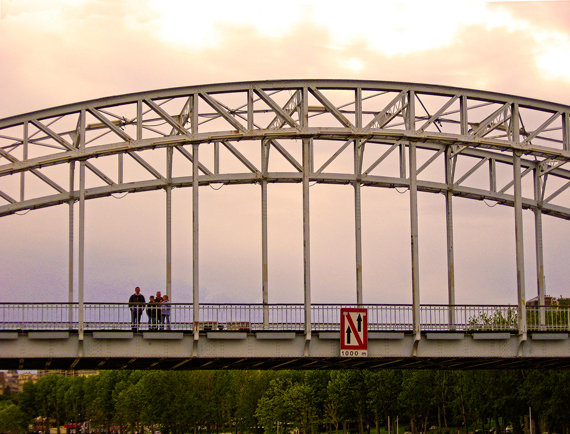 In the aftermath of this incident, Parisians discovered that their romantic bridge had been a preferred rendezvous for East German spies throughout the Cold War. This pedestrian span is the newest Parisian bridge on the Seine, the first built in the 21st century, and the first named to honor a woman. 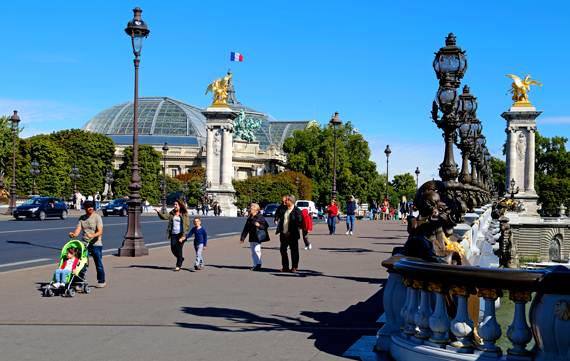 It connects the National Library with multi-faceted Bercy Park, a popular local hangout unknown to most tourists. The bridge honors Simone de Beauvoir, a leading twentieth-century French writer and philosopher, and partner to Jean-Paul Sartre. She has been one of the world's most influential feminists. Just behind the Cathedral Notre Dame, the Pont Saint-Louis connects the two islands in the center of Paris, the Île de la Cité and the Île Saint-Louis. 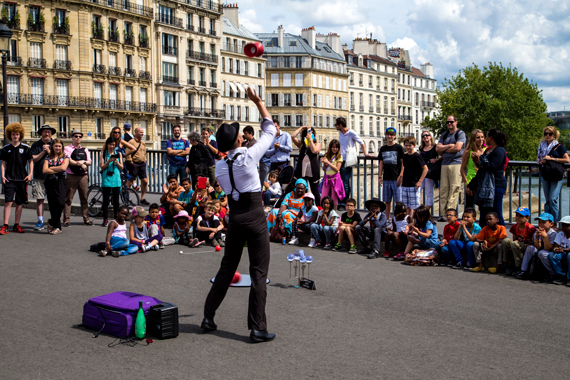 While plain in appearance, the Pont Saint-Louis is one of the city's prime entertainment spots. 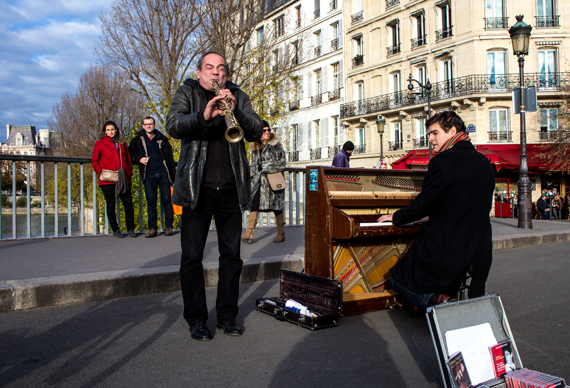 Closed to motor traffic, it is often alive with street performers, clowns, jugglers, mimes, and musicians: accordion players, violinists, guitarists, and even full jazz bands with upright piano, stand-up bass and clarinet. Find your ideal café table, sip wine, eat ice cream and enjoy the sunset. 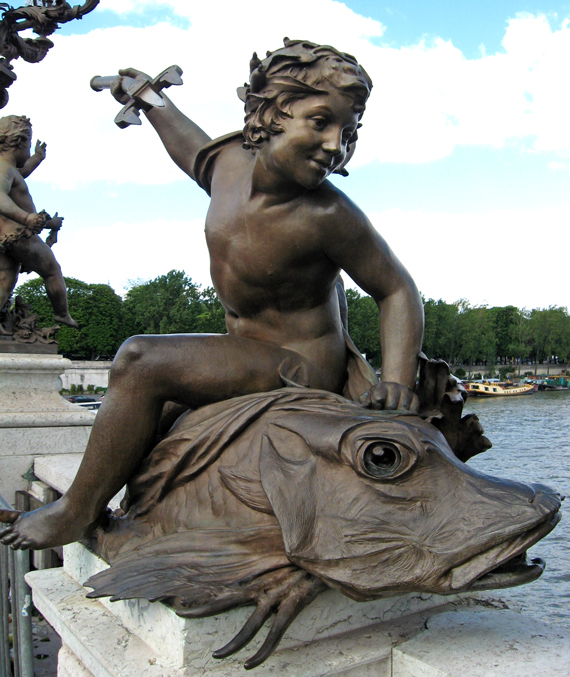 The Pont Alexandre III is Paris's most elegant, grandiose, and sumptuous bridge: one of the most beautiful river crossings in the world. A walk across this bridge takes you on a stroll through what might be thought of as Paris' premiere open-air (en plein air) museum, with an array of masterful sculptures--lions, cherubs, nymphs, maidens, cupids, water spirits, fish, scalloped seashells, and sea monsters. Gorgeous Art Nouveau lamps provide illumination. 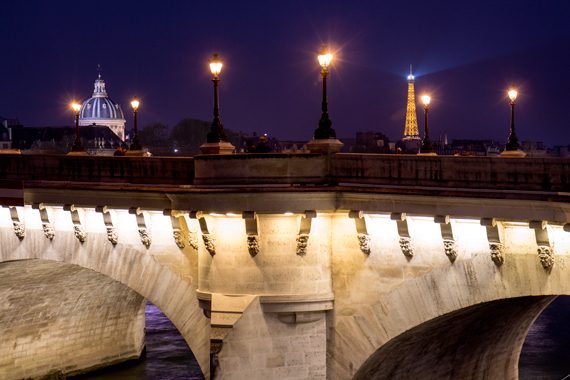 The Pont Neuf has been in the spotlight since its creation in 1608: the oldest still-standing bridge in Paris whose name ironically translates as "New Bridge." A number of bridges were named "Pont Neuf " when they were first built, but this one held on to the designation. It was so called because it was the most recent bridge to be built at the time, but also because it signaled that a new way of life, a Renaissance, had come to the city. 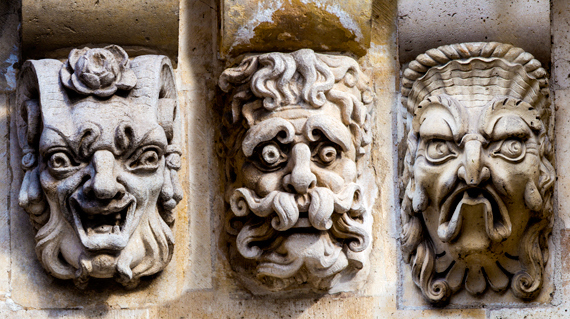 A cornice runs the length of the bridge on both sides, supported by 381 stone brackets or corbels, each with a unique sculpted bas-relief mascaron, a funny or grotesque mask.